That's the first thing my dad told me after he was diagnosed with terminal pancreatic cancer. The diagnosis came as a complete shock. Saturday, we were having an early birthday celebration where he gave me a box full of supplies for my future classroom. Sunday, he called me from the hospital and let me know they may have found a tumor. Two days later, and two months before my scheduled staging date, our worst fears were confirmed. Terminal cancer. But my dad wasn't worried about surgeries or chemo. His concern was that I was still going to Georgia with the Peace Corps. Elyse watches Ugandan participants at the first-ever Camp LION (Leaders in our Nation) doing morning yoga. Elyse helped organize Camp LION during her time as Peace Corps Volunteer in Uganda. I first began to consider the Peace Corps in 2011 when I was serving as an English co-teacher in Georgia with the Teach and Learn with Georgia program. I mentioned to a fellow American teacher that it'd be awesome to be a Peace Corps Volunteer, but obviously it wasn't for me. I wasn't Peace Corps material. He asked me why not, and the question stuck with me for a long time. Why not? I considered Peace Corps Volunteers to be otherworldly beings that could do things I could never do. But wasn't I also volunteering abroad, living with a host family, teaching in a local school and attempting my best at communicating in the local language? I spent a year working up my confidence to apply and building my teaching skills as an AmeriCorps volunteer. I applied in the summer of 2012, nervous that I'd be rejected. When I was nominated for a position in Eastern Europe, an area I've always been interested in, I was thrilled. I completed a second year as an AmeriCorps volunteer while working through the long process of clearances. When I finally received my invitation to serve I was incredibly proud, but also surprised and apprehensive. My nomination may have been for Eastern Europe, but my invitation was for Uganda. Living and teaching in Eastern Europe was one thing, but East Africa was a whole new ballgame. I worried once again that there was some magical other-worldliness to Volunteers in Africa that I didn't have, and that I wasn't cut out for it. I boarded the plane with the feeling that I wouldn't be able to make it. However, I quickly found that the things I was afraid of weren't really that scary. Peace Corps Volunteers aren't magical beings, they're people who are incredibly flexible, curious, creative, and compassionate. They have good days and bad days. They're people like you and, apparently, me. 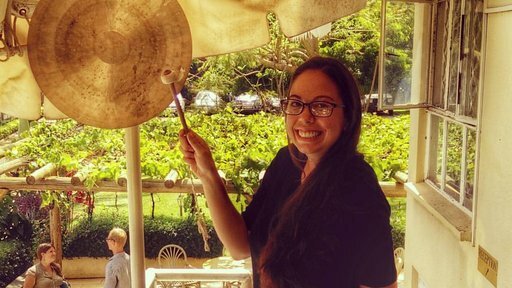 Elyse “gonging out,” a tradition to mark the end of service and celebrate becoming an official returned Peace Corps Volunteer, from service in Uganda. When I closed my service in Uganda, I was proud of what I had done, but I left feeling incomplete. I knew I wanted to serve in the country I fell in love with five years before – Georgia. I turned down the grad school programs I had been accepted into for the chance to serve as a Peace Corps Volunteer again. I received my invitation to serve as an English co-teacher in Georgia in July 2016 and I set about the process again, this time with less apprehension. Then came the diagnosis. My dad told me I was still going because he didn't want to disappoint me. And of course I was broken-hearted, but with a prognosis of a few months to a year there was no way I could leave. I withdrew my Peace Corps application and spent an amazing few months with my dad. His positivity and peacefulness inspired me and set the tone for my entire family. I reapplied for Peace Corps Georgia in June 2017 with my dad's support. He was excited for me to serve in the country I loved so much, and so proud that I was choosing to spread my love for education and literacy to a new community. My dad passed away on August 31, 2017. I received my invitation to serve with Peace Corps Georgia a few hours later. I am so incredibly lucky that I had the chance to spend quality time with my dad, and that I get to serve as a Peace Corps Volunteer again in such an amazing country. 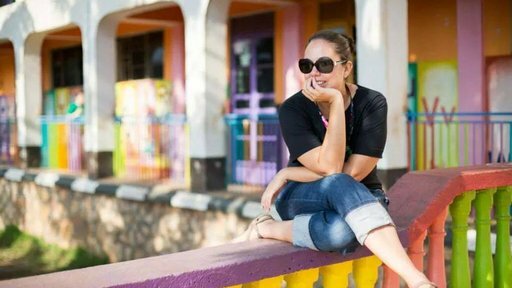 Elyse Painter served as a Peace Corps Volunteer in Uganda from 2013-16. She will depart in April 2018 for Peace Corps service in Georgia, where she will serve for 27 months as an English language co-teacher and youth educator Volunteer.